Ooma Office uses your high-speed Internet connection to deliver a high quality yet very affordable business phone system. Its hybrid solution utilizes on-site hardware and the power of cloud computing to deliver advanced features and quality of service you’d expect from a business class phone system. There are no wires to deploy so installation is a cinch. And what’s more is Ooma Office has plenty of room to grow as your business expands without breaking the bank. Unlimited calling in the U.S. and Canada starts at only $19.98 a month. 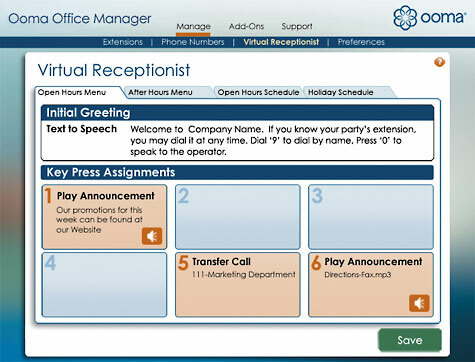 Virtual receptionist, extension dialing, conferencing, music on hold and much more. No special IP phones or equipment needed. Expands to 5 phone extensions and 15 virtual extensions. Manage the office, even when you’re away from the office. The Ooma Office Manager is your one-stop online destination for managing your Ooma Office system. It's the ultimate in convenience; you can change your settings from anywhere that you have an Internet connection, any time you want. You won't have to navigate phone menus and the changes you make will be reflected instantly. Whether you'd like to change your greeting, assign extensions, set up calling groups, your Ooma Office Manager makes it easy.